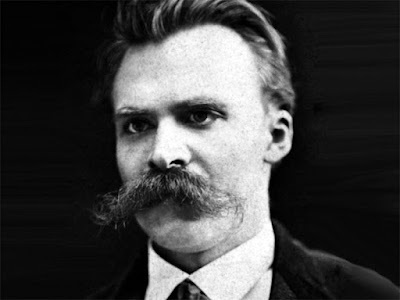 Nietzsche: "Madness, that I may only at last believe in myself!" I came across the following quote in Sue Prideaux's wonderful new Nietzsche biography, I am Dynamite! It's a selection from Nietzsche's book Daybreak, which Prideaux presents as the beginning of his mature philosophy. It reads to me like a credo (from a man who has already experienced too much pain). "All superior men who were irresistibly drawn to throw off the yoke of any kind of morality and to frame new laws had, if they were not actually mad, no alternative but to make themselves or pretend to be mad...How can one make oneself mad when one is not mad and does not dare to appear so?...Ah, give me madness, you heavenly powers! Madness, that I may only at last believe in myself! Give deliriums and convulsions, sudden lights and darkness, terrify me with frost and fire such as no mortal has ever felt, with deafening din and prowling figures, make me howl and whine and crawl like a beast: so that I may come to believe myself! I am consumed by doubt, I have killed the law, the law anguishes me as a corpse does a living man; if I am not more than the law I am the vilest of all men."